I wanted to give the people in this community both a head's up to the opportunity to own a wonderful example of armour as well as a venue to discuss its features. The armour in question is a reproduction harness made by noted armourer Robert MacPherson. It is currently being offered by Hermann Historica, an acclaimed auction house. The armour is a full battle harness, made of hardened and tempered medium carbon steel, the closest possible modern equivalent to original medieval steel. 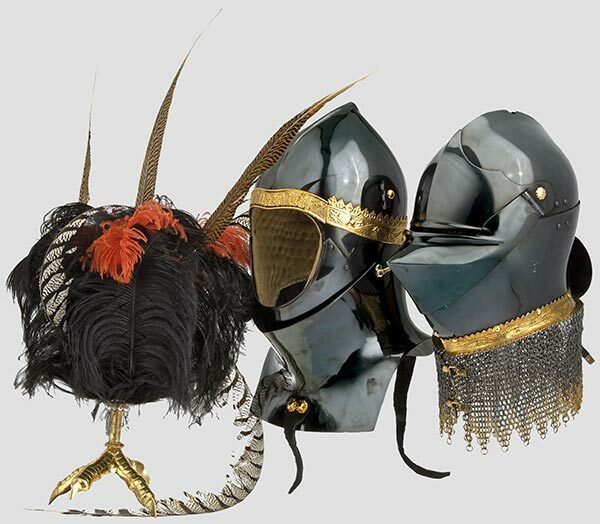 It includes two helmets: a) an armet with separate wrapper, for general field use, especially on horseback and a very impressive luxury claw crest. 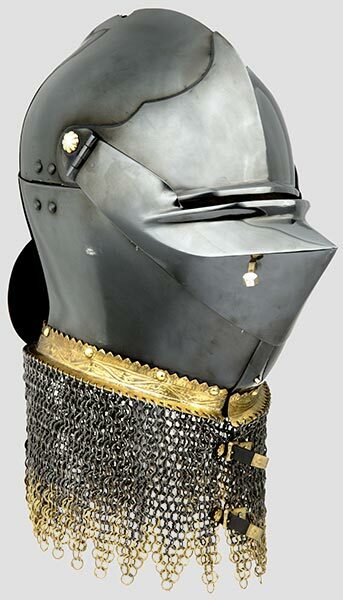 The armet displays a distinctly English character, the visor and brow reinforce, unlike their Italian counterparts, are in form much more like sallets of the period. 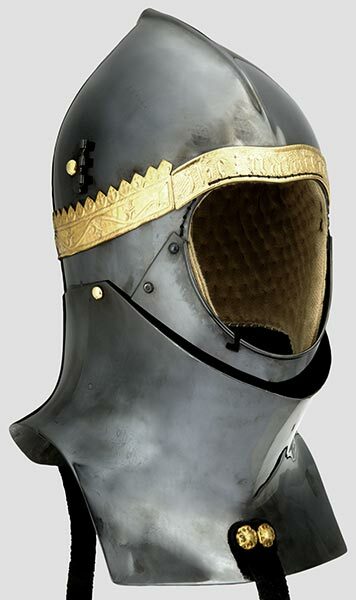 The armet is also fitted with gilded mail by the renowned mail-maker Erik D. Schmid, the only modern craftsman to have discovered the secret of authentic mail-making b) a great basinet, perhaps the most popular head defence in England during the first half of the fifteenth century, worn in both battle and tournament. In battle the English knight often wore the basinet without a visor, but in tournaments visors were essential. This piece includes two, a lighter, rounded visor for the tourney and a heavier, angular visor for the joust. The latter locks closed by means of a spring-pin mechanism. The armour of rich lords and knights was always beautifully decorated. In England, ornamentation most commonly took the form of strips of copper-alloy that were riveted onto the edges of the plates and richly engraved with floral designs and religious inscriptions. These strips, as well as all buckles, hinges, and fittings - copied exactly from sculptural evidence - have been gilded in the same way as the originals. The full visual effect of this form of decoration is here reproduced for the first time since the Middle Ages. The wealthiest knights would also sometimes have their armour blued or blackened, an expensive process that further distinguished them as men of power. This colour has been replicated, bring back to life an image not seen since the fifteenth century. This armour is of special importance to armour scholars because no original armour in the English style is known to have survived to the present day. It represents the culmination of five years of Ph.D. research by Dr. Tobias Capwell, former Curator of Arms and Armour at the Glasgow Museums. Indeed, the distinctive constructional and aesthetic character of English armour in the fifteenth century has only begun to be properly understood as a result of the work of Dr.Capwell. His research, a complex process by which a stylistic understanding of English armour has been reconstructed, was based primarily on the study of funerary monuments. Over three hundred fifteenth-century effigies of men in armour remain in England and Wales, many of which have never been properly studied, published or photographed. These were the key to unlocking the secrets of the English style- several hundred life-sized sculptures, spread throughout the country, never before examined collectively by an armour specialist. But although the study of these artworks yielded a very detailed picture of the development of English armour, there were a number of crucial questions the effigies themselves could not answer. Why was English armour made in the ways represented on the monuments? Why was it so different than continental armour, so unlike the famous Italian and German styles? How did the unusual constructions work? What would the man behind the effigy actually have looked like on the battlefield or in a tournament? This armour was built to answer the questions that only hands-on, physical experimentation could answer. It was made in order to bring back to life one of the great lost styles of armour design, a style that history has forgotten- until now. This creation is one of the finest armours ever produced for modern use. It has been thoroughly tested, in the tournament fields of England, Scotland, and the Netherlands - Dr. Capwell, as well as an academic, is also one of the world's most experienced and successful jousting champions. This armour has kept him alive in combat for two years, and in that time has suffered only the most minor of scratches. A medieval knight would have been proud to wear it. That's pretty amazing. It's nice to see a modern-produced armour with "pieces of exchange" that make it useful for field and variour tournament usage, like many old harnesses had. The detail work on the brass pieces is phenomenal. I also really dig that great bascinet. Thanks for sharing this. This harness is in his photogallery but these pics are much better. HOLy S! @# thats a great work! I've had the opportunity to maintain some pieces Mr. MacPherson has done in the past for a jousting troupe and they were a real pleasure to handle but are dwarfed in comparisson to this harness. He is truely a master! Beautiful work! Thanks for sharing pictures of the harness. To simply call that impressive is an understatement. This shows the attention to fine detail that separates a craftsman from a true artist. I also think the interchangeable pieces are a very neat feature. I would say he is the best! I have seen several of his pieces and recently heard him speak on armor design and construction and have to say that the detail and commitment to doing right are beyond what anyone else that I know of is attempting. Just done to a degree that makes me sit back in wonder. This piece is truly magnificent and when one sees other pieces he has done it just drives home what is possible and how far short the rest of us fall. Thanks for the find, Nathan. The lines of the armour w/ the wrappered bascinet are sheer beauty! The form of the bascinet is spot-on and world class. 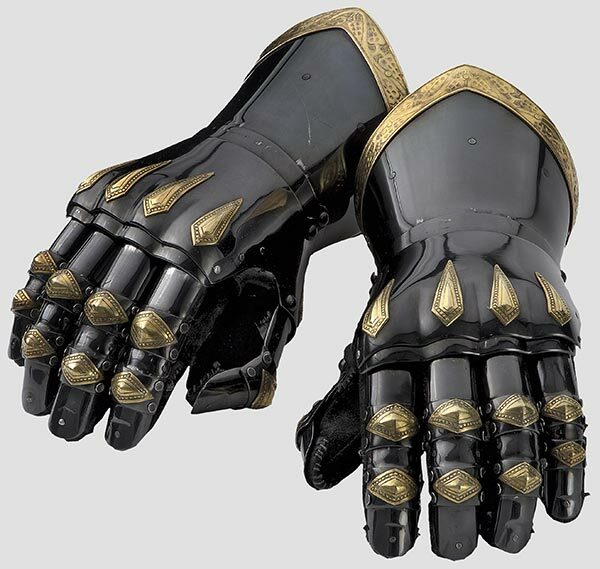 The same goes for the gauntlets. It is in the details, that this harness excels. One can see the extrapolated lines of the effigies, especially in the pauldrons and cuirass/faulds. A bit of artistic license shows through. It is the most beautifull armour I've ever seen.I'm not kidding-it is outstanding!Thanks for posting it. I had the chance to do a closer examination of parts of this armour set last year in Vienna. That is a gorgeous harness. It is only the second "Englyshe-style" armour I have seen reconstructed, the other being Graham Turner's armour, which isn't anywhere near as elaborate. So this is the type of armor that various Plantagenets, Nevilles, and Beauforts wore during the Wars of the Roses. Or is it designed for tournament use only? It looks like it could be used for the dismounted "English style" of fighting. Either way, It really is beautiful. I have a feeling that this could used for both, i.e. it was primarily a field armour with exchange pices for tournaments. Judging by English effigies and brasses from this period, Milanese "export" and German "Gothic" styles were also used in England. I've to say that this is absolutely stunning and eye opening. Never have I seen an armor made so amazing... does anybody share my thought that it screams "Black Prince"? I know the time frame is different but that blackening of the armor brought the thought up. Amazing skill and artistry! Thanks for posting this harness. Now I have something else to dream of acquiring someday! It's not my style either but I still think it's one of the most impressive harnesses I've seen. I've seen photos of Toby Capwell wearing it during a joust at the Royal Armouries, I believe. It looks even more impressive in use. That is, flat out, the most impressive and best armor that I've ever seen. Amazing. What a wonderful piece of art. Marvellous. Thanks for sharing. All I can say has been said, but with helms alone running $1500+ I would have to pay this customers tab!